Soak up the sunshine with fine champagnes, freshest local produce and the hottest watersports. The best way to experience the beautiful Mediterranean is from your own private yacht. Charter Maia Fair and experience life on the water – just you and a cooling sea breeze. Set the pace for your lap of luxury aboard Maia Fair by tailoring the route you take and the watersports you enjoy. We offer a personalised yacht charter service with a large range of activities. From splashing around in the waves to fulfilling a need for speed, we’ve got the toys. And if you want, we also have a personal trainer with watersports expertise. A high performance boat that’s a haven for watersports enthusiasts. 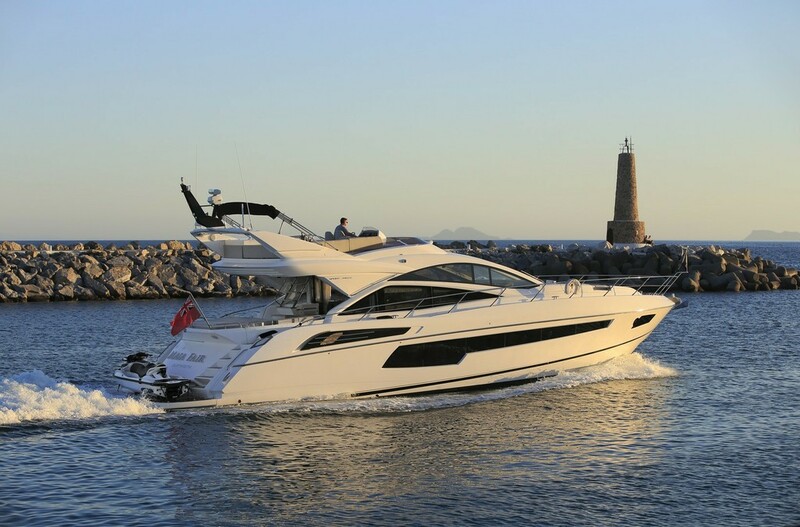 With a 3,500 litre fuel capacity the shores of Italy are within range for longer charters. With a daytime charter capacity of 12 guests and 2 crew, overnight yacht charters can accommodate 6 guests and 2 crew. Designed with families in mind, there’s a convertible cot/bed in the twin cabin as well as the added screens on the flybridge. In addition to the spacious saloon, your very own roof terrace provides a fridge, barbecue and additional steering controls.